n taking this course, students will understand the content of, and requirements for, ISO 18404:2015 for both individual practitioners and organizations. This course will be of benefit to anyone or any organization involved in, or considering implementing, Lean and/or Six Sigma, whether or not they are committed to organizational certification against ISO 18404:2015. On successful completion of this course, students will be awarded a certificate of completion at no extra cost. The main objectives of this course are to introduce the reasons that the ISO 18404 standard was developed, what it provides, and why it is worth certifying an organization. It aims to provide practical advice on preparation for certification, including the steps to be taken and what to do if things go wrong, as well as helping you prepare your organization for certification for Lean and/or Six Sigma under the ISO standard. Students are able to contact the course tutors at any time to clarify anything that they do not understand. With this course, you’ll receive 12 months access from the date of purchase as well as FREE 24/7 tutor support! This ‘Preparing Your Organization for ISO 18404’ course is designed to assist participants to understand the content of, and the certification requirements for, ISO 18404:2015 for both individual practitioners and organizations. This course will help to prepare your organization for certification for Lean and/or Six Sigma under the ISO standard and is idea for anyone or any organization involved in, or considering implementing, Lean and/or Six Sigma. Start learning the Importance of Lean & Six Sigma and the role of the new international standard ISO 18404 today! Why Study ISO 18404 With 4PA? It is particularly relevant to managers in all types of organizations including manufacturing, service, public sector and voluntary organizations. It is also of particular interest to manufacturing and other engineers and good preparation for implementation and management of a Lean and/or Six Sigma programme. Upon successful completion of this course, participants will receive a free certificate of completion judged on a number of multiple choice exams. If for an reason, participants require additional help, a tutor will be on hand 24/7. The first lesson is designed to test your current knowledge via 2 multiple choice tests. By the end of the course, you will have the knowledge to answer everything here, and more!  What is a Project? The second lesson will help you to develop an understanding of the core concepts and use of Lean & Six Sigma methodology, the need for standardization and the role of ISO18404. This lesson will be delivered via an array of audio and visual interactive learning methods and includes a multiple choice quiz. In this third lesson, participants will develop knowledge of ISO 18404:2015, the certification requirements for organizations and individuals, and the process for becoming certified. In lesson four, participants will be able to clarify criteria for whether an organization should use ISO 18404, and provide understanding to assist organizations to become certified. The fifth and final lesson will assist the participants to get started with using ISO18404, clarify the first steps and the initial stock-take, and discuss the monitoring and review process and links to ISO 9001. 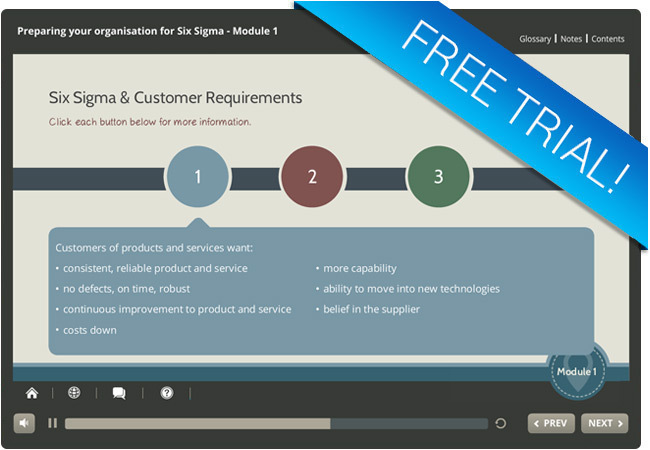 Why not try out a free trial module from our ISO 18404 Lean & Six Sigma: Preparing your Organization eLearning course! In this free trial, you will learn the importance of Lean and Six Sigma as well as key aspects, and the role of the new international standard ISO 18404. Like the full ISO 18404 Lean & Six Sigma: Preparing your Organization eLearning course, you can access this free trial module from any device whether you are at home, at work, or on the move! In taking this course, participants will understand the content of, and the certification requirements for, ISO 18404:2015 for both individual practitioners and organizations.